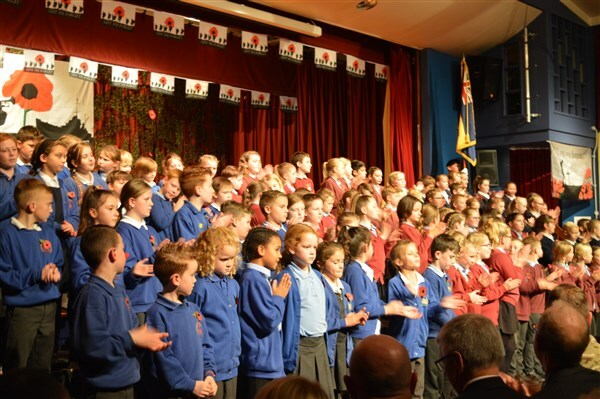 Smithdon Cluster schools that are part of West Norfolk Academies Trust took part in a WW1 themed concert to commemorated the 100th anniversary of the end of the Great War. On the 12th November 2018, students from six schools within the West Norfolk Academies Trust marked the moment the guns fell silent at the end of the First World War as they presented a musical showcase. This event brought together many veterans and servicemen from across West Norfolk along with the High Sheriff of Norfolk, The Mayor of Kings Lynn, The Rotary Club and the Royal British Legion. The students also had the pleasure of performing to WW2 veteran Cyril Route who was 95 on the day of the performance. This occasion was marked by the 120 strong choir and 300 audience members singing a collective Happy Birthday! The event involved primary students from Walpole Cross Keys, Clenchwarton, West Lynn, Heacham, Snettisham and Gaywood schools. The students took to the stage at Springwood High School to present WW1 inspired songs and poetry as they remembered the fallen. Not only did this event bring the students and parents from across the schools together, but it also signifies how the trust strives to raise standards across all of its sites, by sharing opportunities and staff in order to provide an excellent education for young people in West Norfolk. Songs included Pack up your Troubles, It’s a Long Way to Tipperary and Keep the Homefires Burning; along with remembrance poetry that the students had been studying and composing in class. The performance was a bespoke piece and took the format of each school having their ‘moment’ on stage to present narration, poetry and song. Students from all of the schools joined together at the beginning and end of the performance to collectively perform some of the classic tunes that kept the nation going during the Great War. This magical event involved Kings Lynn Mayor Nick Daubney (who is also a WNAT trustee), doing a reading of the poem The Soldier, by Rupert Brooke. The evening finished with students being presented with certificates of participation by Charles Watt, current High Sheriff of Norfolk.